SCORPIO’s ballistic computer, re-configurable for selected ammunitions, provides an enhancement of the hit probability against stationary and moving ground targets. © Selex Galileo. Q: What is the state of play with those optronics systems optimised for use within future soldier systems? A: Our technology is currently being driven by the needs of the Italian army. We spend a lot of time working with the end user in developing a solution and delivering it to their requirements. The Soldato Futuro system is now entering its Pre-Production Phase, delivering about 500 pieces for the Italian Army’s Forza NEC programme. The goal is to establish an operational acceptable solution, that is proven in trials, ironing out any final problems and making additional improvements. Then, after the next phase of trials expected in 2012, a further batch of about 1000 Pre-Full Scale Production equipment sets are expected to be ordered to a full scale production standard. Additional numbers will then follow, depending on available funding. 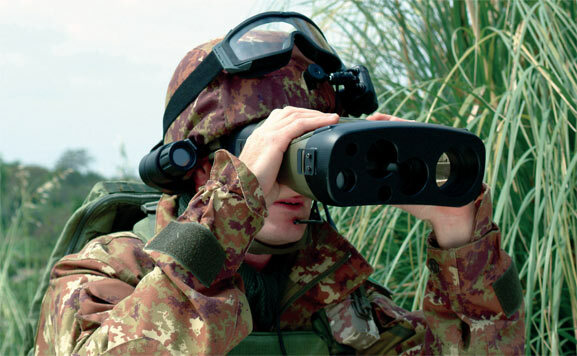 SELEX Galileo is responsible for the optronics part to the system and, together with SELEX Elsag, both Finmeccanica Companies, is offering the complete Soldato Futuro solution, including C2, communications and other components required for the next generation of soldiers. Q: Could you break down the component parts of the optronics solution? A: Our optronics part is composed of four equipments; the SCORPIO grenade launcher, the ASPIS rifle sight, the NIMOS head system and our LINX binocular multifunction device. 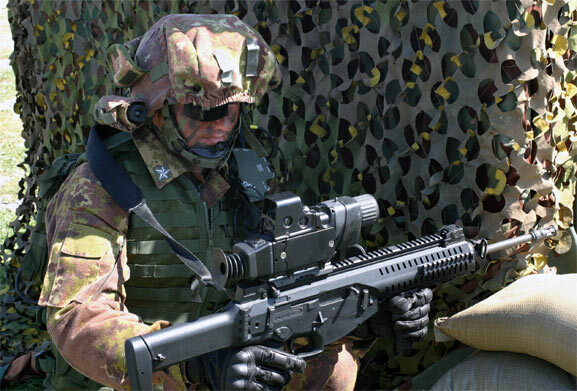 Two of these systems; SCORPIO and LINX, after having implemented some emerging requirements from the Italian end user, are very near to the final configuration for the Italian Army. The other two systems are subject to further testing and renewal including adjustment of specific ergonomic aspects of the system. The ASPIS rifle sight has been reviewed together with the end user after in service trials in order to reduce its weight and increase modularity. That work has now been completed with the new design beginning further testing very soon. The improved rifle sight will still include a CCD plus IR channel but it is now in a more compact package and is more user friendly in regards to changing batteries and the sight’s position on the rifle itself. Moreover, in parallel to these improvements, we are considering customer requests to ‘open’ the system to make it capable of integrating third party components. If a Picatinny rail is introduced into the system, you could combine different devices, integrated by us but supplied by third parties. We see that as beneficial in terms of the export market where we often have to address different customer requirements. This is an ongoing improvement and, once we complete the present developments we will be ready to supply different configurations to the end user as they need them. The improved ASPIS retains the same core performance features; notably the ability to share information with Soldato Futuro’s C2 equipment, supplied by SELEX Elsag as well as sending imagery to the eyepiece on NIMOS. We are improving NIMOS in terms of opening the system to other solutions. The user wanted us to continue to be able to integrate with not only a TV channel but also an alternative night vision goggle, or in the future a combined II/IR fused device. In order to follow future technology, we are improving the system to offer a more flexible solution based on the mission of the soldier. In close combat, soldiers may need different equipment to other roles such as rescuing other soldiers in the field. With this solution we can configure the solution depending on the platoon and soldier requirements. We are currently in the process of making these improvements. The ASPIS rifle sight features aiming laser pointers for close combat operations and uncooled infrared, day TV, and “shooting around the corner” video outputs transmitted to the soldier by wireless technology. © Selex Galileo. Q: Soldato Futuro is a key to the Forza NEC initiative. How is that work progressing? A: Forza NEC is currently in its Concept Development and Experiment phase. As soon as the system components are validated within a total architecture, they will enter into production to equip three mechanised brigades in a multi-year programme. At the moment, activity is focused on building up the network architecture to connect the different parts of the Forza NEC system, starting from vehicles and linking to dismounted soldiers. Q: With Scorpio and Linx now almost complete, are there plans to field them independently of Soldato Futuro, both in theatre and with other units? A: At the moment, the plan is to use them within Forza NEC. The Scorpio is connected to the Beretta rifle. It has however also been successfully added to other rifles and to other grenade launchers on other rifles by changing the ballistic table for that specific rifle. Linx can be used as a stand alone system and we have evaluated Linx for other applications and has been sold in small quantities. However, today the main effort is to support the Italian Army has part of the Forza NEC. We are also promoting it on the export market and hope to get positive results, recently completing successful trials with an Asian military and we are waiting for positive news in 2012. Q: What are you doing in terms of promoting future soldier systems outside of your work on Soldato Futuro? A: We have spent a lot of time abroad, supporting a number of different militaries in testing. What we call future soldier today is not truly future soldier as the future is far from now. We are actually building hardware and are in production today, not in the future. SELEX Galileo is continuously experimenting and testing for its own sake. We are in a solid situation regarding production and launching the first release of the system for real users in the field. We have spent a lot of effort, making our optronics flexible so that they can be interconnected with any standardized solution seen on the market today. We can of course provide a complete optronics package together with Selex Elsag for those requiring a turnkey solution. However, each country will be looking for its own tailored solution. Some want a simplified solution, others a very integrated system. We have a flexible concept for different types of requirements. We can offer our product to different customers with different requirements and are active in the Middle East and Asia and we are talking with many companies and organisations. Many requirements are to meet the urgent needs of customers to apply force on the field now. To do that, they need individual equipment validated and operable tomorrow. SELEX Galileo does that. Another area of business is where we can offer a path to an integrated, digitized solution, permitting automatic connection with higher levels of C2 systems in two to three years time. LINX is a hand-held target locator which includes an uncooled thermal imager for all-weather observation and detection, day optical telescope, eye-safe range finder and digital compass in a lightweight unit. © Selex Galileo.